For fans of Jerry Spinelli's Maniac Magee, Gary D. Schmidt's The Wednesday Wars, and Jack Gantos's Joey Pigza Books comes a hilarious and poignant slice-of-life novel from critically acclaimed author and poet Peter Johnson. When an author comes to speak to his class in a rundown area of Providence, Houdini decides to make money by writing his own novel. Houdini chronicles his life as he and his friends start a leaf-raking business, befriend Old Man Jackson (a Vietnam War veteran with a seriously intimidating dog), and get even with the neighborhood bully, Angel. But it's hard to find a way to write about his dad losing his job or his brother, Franklin, who is first reported missing in action in Iraq and then still seems to be missing when he comes home. No matter what, Houdini and his friends rely on one another to figure out how to do the right thing. And Houdini discovers that writing and thinking about his friends and family lets him get to know them in completely new ways. Peter Johnson grew up in Buffalo, New York, at a time when they had a good football team, which seems like fifty years ago. Similar to Benny Alvarez and his friends, Peter always loved words, knowing he was going to be a teacher or a professional baseball player. Also, being from a long line of Irish storytellers, he loved reading and telling tales, and when he realized that his stories changed every time he told them, and that he could get paid for this kind of lying, he decided to become a novelist. 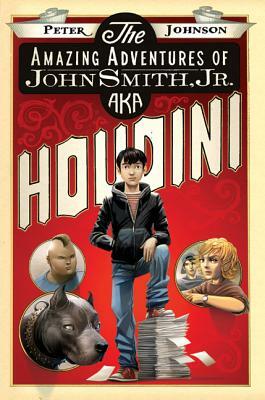 His first middle grade novel, The Amazing Adventures of John Smith, Jr. AKA Houdini, was named one of the Best Children's Books by Kirkus Reviews, and he's received many writing fellowships, most notably from the National Endowment for the Arts.